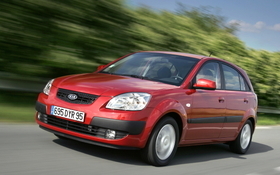 Strong sales of the Rio boosted Kia's January sales 35% in Russia. Kia finished the first month of the year as Russia's No. 3 brand thanks to a 35 percent rise in sales. Led by the Rio, Kia increased its January unit-sales volume to 4,920 from 3,635 during the same month last year, according to data from the Association of European Businesses in the Russian Federation. Kia ended the month just 198 units behind sister brand Hyundai in the race to be Russia's top-selling foreign brand. Lada, from Russia's AvtoVAZ, easily maintained its No. 1 spot despite a 41 percent sales drop to 17,308 units. Overall new-car sales in Russia fell 37 percent in January from a year before, extending the pain the market has felt since the global economic downturn hit the country in late 2008. The bad start has dampened hopes the market will avoid a second consecutive year of collapse.